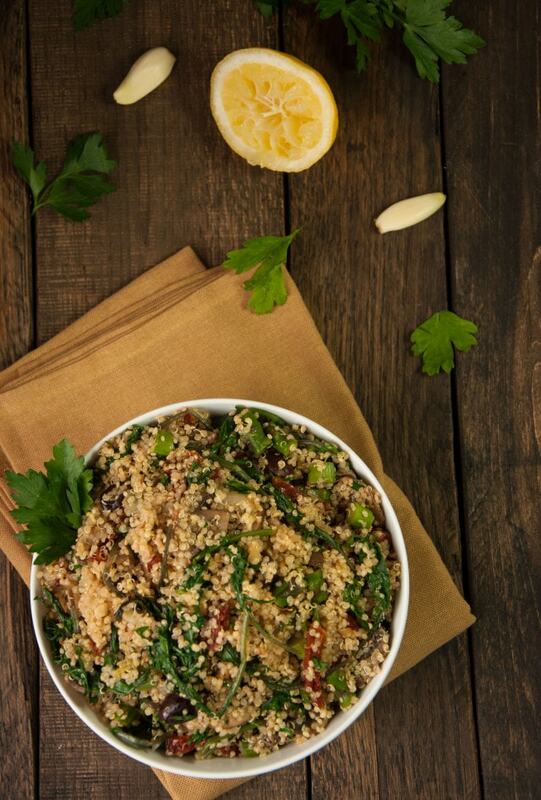 Light and tasty lemon quinoa salad that is vegan, easy to make, highly customizable, and chalk full of vitamins! So, we finally have the appraisal scheduled for our house. Of course, its scheduled for Monday morning at 9am and we have dozens of unfinished projects, 3 birthday parties, and a baby shower to cram into the weekend. Oy vey. Luckily, my awesome little sister came over to help me tackle some of the projects. We finished the upstairs guest room last night and its looking super cute. Not fully put together yet, but MUCH better. I’ll post a picture within the next week or two when its looking a little more livable. Its amazing how getting rid of clutter, fresh paint, and new flooring makes the space seem huge. In our tiny house, any space we can get is a major score! are a staple in my house so those were an obvious choice. If you use sun-dried tomatoes that aren’t packed in oil, you will probably need to add a little olive oil to this dish or it will be a dry and the quinoa won’t be as fluffy. Speaking of add-ins, I topped the leftover quinoa salad with toasted walnuts and grated parmesan the next day and that took this dish to a whole new level of awesomeness. If you aren’t vegan – add parmesan! It is sooo good in this. I left it out of the main recipe and listed it as optional to keep it simple and vegan, and its perfectly good as is. 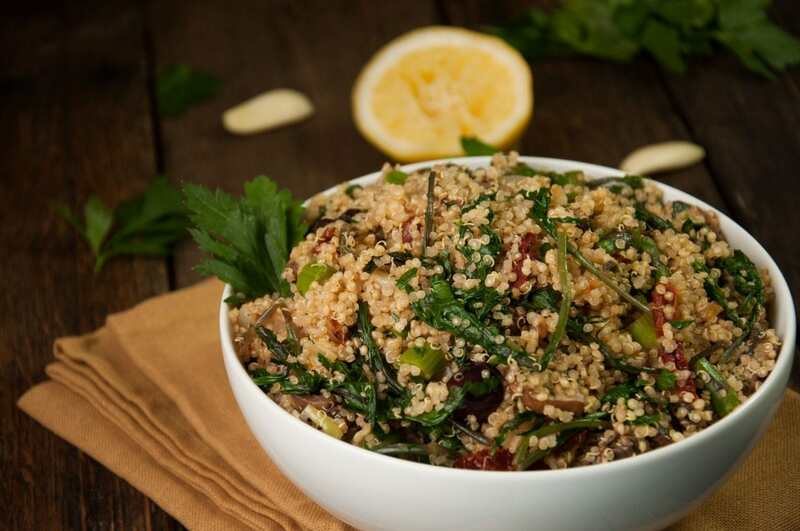 The lemon and parsley add a zingy level of freshness to the quinoa, while the olives add that salty, savory element that makes this a tasty, versatile side dish. Add in beans and up the serving size and you have yourself a one-dish vegan meal in 30 minutes or less. Perfect for busy nights where food prep is the last thing on your mind! Cook quinoa according to package instructions (you should end up with about 6 cups of cooked quinoa). While quinoa is cooking, heat coconut oil over medium-high heat. Add onions and cook for 1-2 minutes. Add asparagus and cook for another 2-3 minutes. Add kale and cook a minute longer to wilt. Remove vegetables from heat and toss with cooked quinoa. Mix salt and cayenne pepper into lemon juice and toss with quinoa. Add remaining ingredients and toss to combine. Can be served warm or chilled.